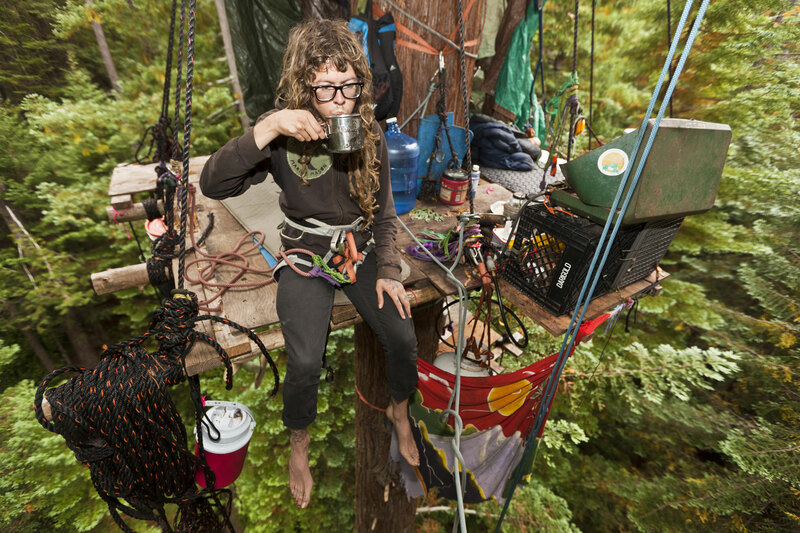 'Carbohydrate, an alias name this tree-sitter gave himself, sips a cup of tea from the wooden platform he built in a 220ft giant redwood tree in Trinidad, California. Tied by his waist to the 7ft diameter trunk of the 130 year old tree with climbing rope, his goal, along with other tree-sitters, is to stop logging companies from clear-cutting the forests. Nestled deep in the trees, tree-sitters cook, eat, sleep, use the bathroom, connect to the internet, and keep entertained on platforms as small as 4ft by 8ft for weeks to sometimes years at a time.